After spending years railing against the excesses of the wealthiest Americans, and after refusing to release his full tax returns when he ran for the Democratic nomination against Hillary Clinton, on Monday evening socialist Vermont senator Bernie Sanders released a decade's worth of tax returns which confirm that, as had been extensively leaked before, he is indeed among those that can be called a filthy capitalist millionaire. 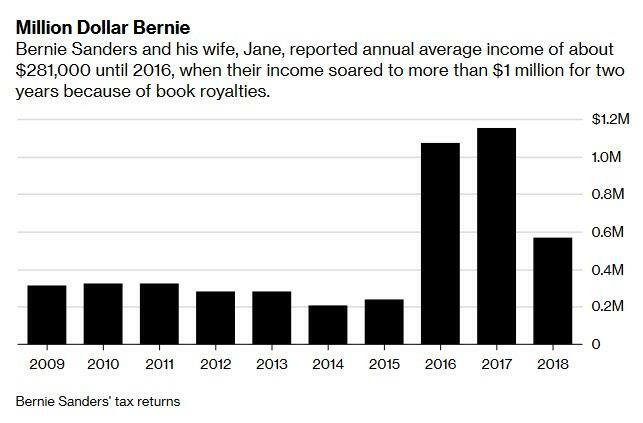 Sanders' highest grossing year in the past decade was 2017 when his books earned him $875,000 in royalties, resulting in combined income for Bernie and his wife of nearly $1.2 million; they paid an effective rate of nearly 32 percent on that income. In 2016, the couple reported a little more than $1 million, mostly from sales of the book, which was also translated into five other languages. "These tax returns show that our family has been fortunate," Sanders said in a statement accompanying the tax returns, without elaborating why he did not turn around and submit an even greater remittance to the IRS, as he now demands all wealthy Americans should do.